Must-try local products from toners to spritzes. 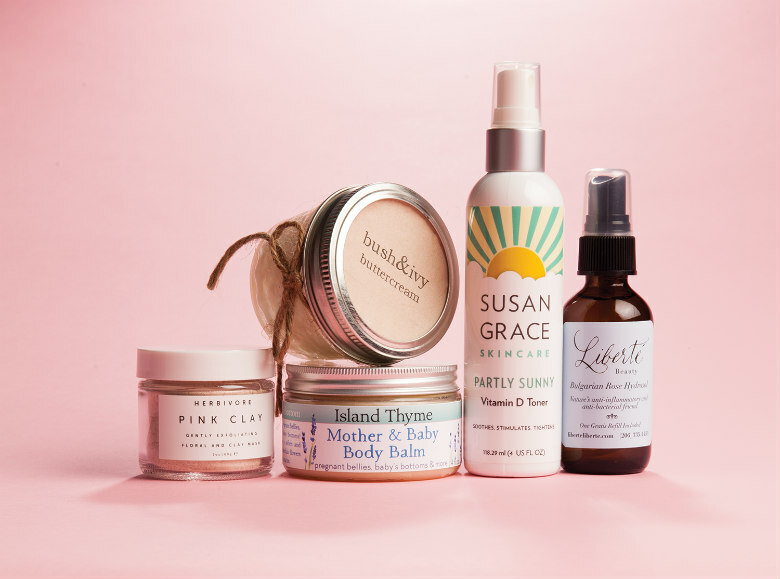 Give skin a spritz of sunshine, whatever the weather, with Partly Sunny Tone Well vitamin D toner (1 ounce/$10, 4 ounces/$29) from Susan Grace Skincare (Ballard, 5424 Ballard Ave. NW, Suite 300; 206.414.9633; susangraceskincare.com). Vitamin D is particularly important in the often cloudy Northwest and can be absorbed easily by skin through this topical spray application. Intended for all skin types, this toner also contains seaweed, which naturally smooths and renews tissue. The toner is compact enough for a gym bag or desk drawer for whenever you need a refreshing boost. Buttercream ($15) is a luxurious skin solution—a perfect soother after waxing—from Bush & Ivy Wax Boutique (Ballard, 5227 Ballard Ave. NW, No. 4; 206.617.7956; bushandivywax.com). Both antibacterial and antimicrobial, Buttercream, along with exfoliation, also helps to prevent ingrown hairs between waxes. Using simple ingredients, such as shea butter and coconut oil, owner Christa Kelly makes each batch by hand with the help of her mom, Barbara. Treat yourself to the pink clay exfoliating mask ($22) from Herbivore Botanicals (herbivorebotanicals.com), known for its organic, plant-based products. Herbivore’s mask combines French pink clay, rosehips and chamomile; slowly add clay to water to form a paste. Spread on and let dry to regenerate cells, revive skin and reduce puffy inflammation, then wash away to reveal brighter skin that can face any day. Mother & Baby body balm (4 ounces/$20, 8 ounces/$32) from botanical-based skin care company Island Thyme Botanical Bodycare (islandthyme.com) helps soothe growing bellies and baby’s sensitive skin. The balm is crafted with infused oils made from lavender grown on Orcas Island in Island Thyme’s own gardens. In addition to its moisturizing properties for mothers and babies, it also makes a great everyday salve for dry, itchy skin. Liberté Beauty (Ballard, 1737 NW 56th St.; 206.335.4453; liberteliberte.com) bottles the go-to mist every woman should have in her medicine cabinet. The versatile organic Bulgarian rose hydrosol (2 ounces/$14, one gratis refill included) can act as a facial pick-me-up, hand sanitizer or a skin soother after a sugaring session. The amber glass bottles can be refilled, eliminating the potential for carcinogen leaks from plastic, for a high-quality spritz every time.